Steve Young is the nephew of Angus and Malcolm Young, the son of their brother Alex and was born 11 December 1956. As a member of the Young family, Stevie took an interest in music, and especially in guitar, at a very young age, following his uncles' example. He joined up with his first band, Stabbers, at the end of the 1970s. In 1980 Stevie put together a very promising band called 'Starfighters'. The band, made up of English musicians only, offered a music highly inspired by AC/DC. The Starfighters recorded two albums, 'Starfighters' in 1981 and 'In Flight Movie' the next year. Stevie's first live experience with AC/DC happened in 1981 while the Starfighters were chosen as opening act for the Back In Black world tour, just after the release of their first album. But the Starfighters split up and no one heard of Stevie until May 1988. At that time AC/DC had just ended the Blow Up Your Video European tour and were getting ready to start the American leg of the world tour. However Malcolm decided not to join the band for the US tour in order to take a rest and get rid of his alcohol dependency. 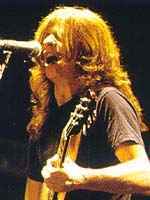 The band called up Stevie, Malcolm's musical and physical double, to play the rhythm guitar for the American concerts. Stevie joined with the band in Boston for a series of rehearsals and took Malcolm's place on stage in Portland on May 3, 1988. In the beginning of 1989 Stevie came back to England and put together a new band called 'Little Big Horn'. The band recorded a demo tape coproduced by Malcolm Young himself but had to split up during the Winter of 1993 after unsuccessful attempts to sign a deal with a proper record company. Afterwards Stevie built up yet another band, Up Rising, that split as well. Since that time Stevie has disappeared from the musical scene.